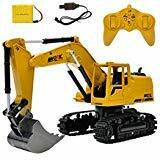 RC Excavator toys are a lot of fun for kids to play with and can be a fantastic introduction to remote control toys. They aren’t fast which makes them more accessible to younger kids and beginners to these kinds of toys. There is a range of different ones available that have realistic designs, light and sound effects, and spinning cabs that let kids play for hours and use their imagination. If you’ve been worried about finding the right one, you’re in the right place. We’ve researched and reviewed the best options available so that you don’t have to. Simply read through the review below and use the buyers guide to help you make the most informed decision! With 17 channels available, you can be sure that your little one is provided with plenty of control over this toy. We liked how there are 3 motors which work to power the shovel and arm independently. Kids have been loving how it comes with headlights and sound effects too. This makes it feel more exciting to play with and improves your little one’s auditory and visual learning senses. The shovel and arms are made out of high-quality alloy materials too. Therefore, they’re durable and can handle picking things up and moving them around. Your child’s motor skills and hand-eye coordination are able to develop while using the remote as well. We were impressed with how this one features lights and sound effects as it makes the playing experience more exciting and stimulates your child’s auditory and visual learning senses. 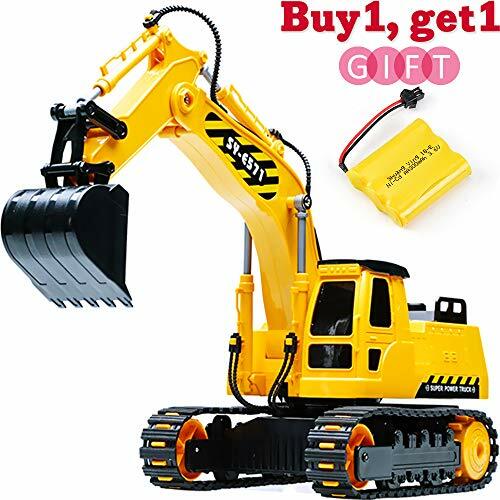 The Top Race RC Excavator comes with powerful motors which work to make all of the functions works so well. This means kids can use the digging arm and shovel to pick things up and move them around without any hassle. Your little one can be standing up to 100 feet away from the toy and still have total control. Moreover, it works with a 2.4Ghz frequency, which is fantastic for lettings kids have precise control. Their motor skills and hand-eye coordination are able to develop well by using the remote too. After being fully charged for 40 minutes, kids can play with the toy for a total of 20 minutes, which is plenty. 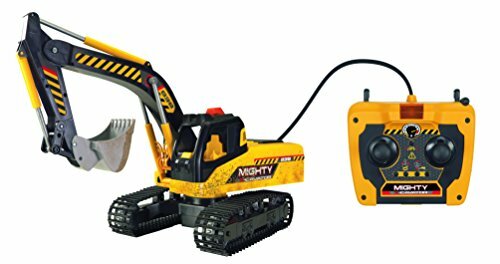 The 3 powerful motors available with this toy ensure that kids can pick up different things using the arms and shovel without it wearing down any time soon. 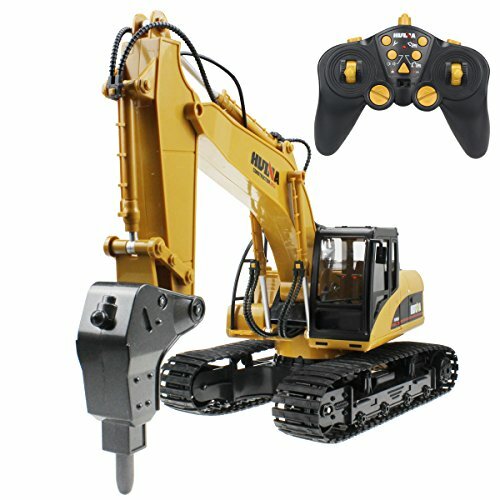 We liked how this RC excavator comes with sound effects as it makes for a more immersive playing experience. It’s also awesome for your little one’s audible learning senses. The 8 channel remote control allows kids to have total control and freedom to move the toy in any direction they like. Their hand-eye coordination and motor skills are able to develop well as a result. There are also 3 powerful motors which work effectively to make sure that the arms and shovel can operate well. This is also great for powering the toy to be able to move up inclines. This is a fantastic options that lets kids control it to move up inclines with no issues, while also having fun with the sound effects that are available. 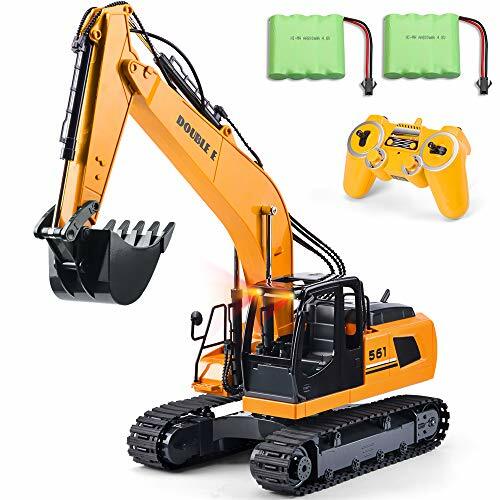 This RC Excavator comes with a grabber, shovel, and a breaker, which provides kids with plenty of functions to play with and be entertained for hours. We were impressed with how steel materials have been used to construct the shovel. It allows kids to pick different items up and move them around with out any issues. Furthermore, the rest of the materials include high grade ABS plastic which are durable and free from toxins. While kids are using the remote to control the toy, their motor skills and hand-eye coordination are able to develop well. The remote is also very responsive and easy for children to use. 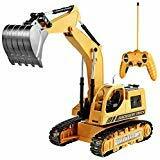 We liked how there is a grabber, breaker, and shovel available as it ensures that kids can have a blast using the different features to keep themselves occupied for hours. The 2.4Ghz frequency controller that’s included with this one ensures that kids have a strong connection with the toy, even while standing up to 100 feet away from it. Their motor skills and hand-eye coordination can improve while using this remote as well. We were impressed with how they’ve implemented flexible joints with this excavator toy as it allows them to use the shovel to pick things up and move them around with smoothness. It can also spin around 360-degrees which gives children more freedom to play how they like. In addition to this, they have used high-quality ABS plastic materials to construct this toy. This had allowed them to add some fantastic details to the design, while also ensuring that it’s durable and safe for kids. The 360-degree spinning cab and flexible joints are excellent for allowing kids to play with the toy in more inventive and creative ways. 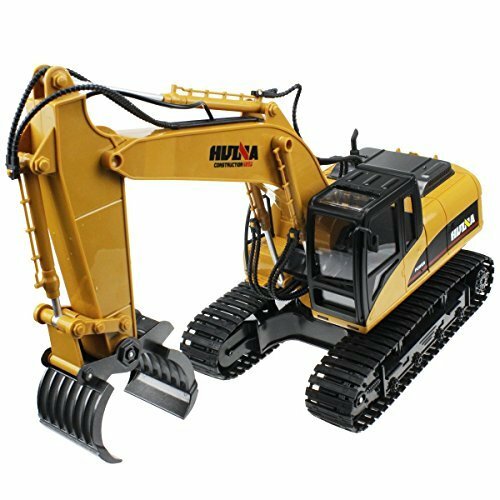 Top Race’s RC Excavator comes with a shovel that kids can use to dig, as well as a grapple fork that lets children grab and lift things. These enable kids to use the toy to play in more imaginative ways to improve their creative thinking skills. Metal materials have also been used to construct the shovel which keeps it durable. Furthermore, there are 3 motors available that work to power the rubber track tires to ensure the toy can move along smoothly. We were also impressed with how the cab is able to turn 680-degrees and allows kids to use the remote to move it in any direction they like. As a result, you can expect your little one’s motor skills and hand-eye coordination to improve. 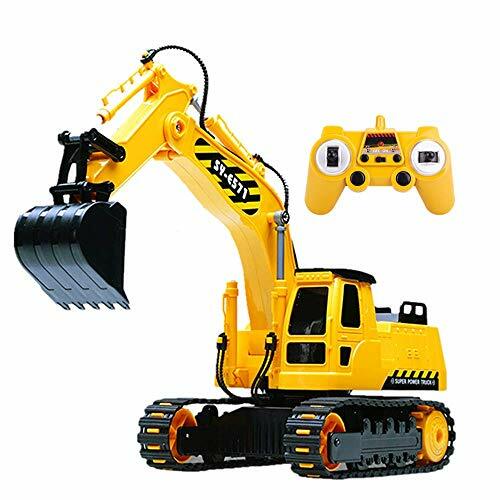 With the 680-degree spinning cab and the digger and fork lift available, children are able to play with a lot of creativity to keep themselves entertained for hours on end. The motors that have been fitted into this one are incredibly powerful and allow kids to simulate what it’s like to use a real excavator by being able to dig into dirt in the ground. There are also headlights and smoke effects available too. Therefore, kids are provided with a more realistic playing experience, which is awesome for encouraging them to be more creative. Using the remote to control the fork, shovel, drill, and smoke features is a fun way for your little one to develop their motor skills and hand-eye coordination. It takes around 2-3 hours to fully charge, which lets children play with it for up to 50 minutes continuously. The USB cable that’s available is also awesome for making charging effortless. The smoke and light effects ensure that kids are able to use this RC toy to play with more imagination and develop their creative thinking processes. 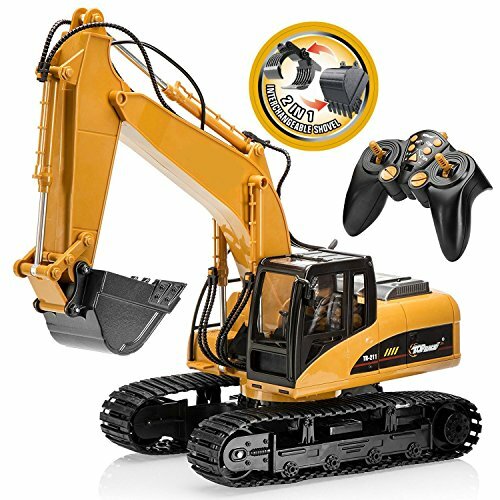 This excavator toy has a 360-degree spinning cab that lets kids have more freedom with how they want to control the toy. Using the remote is an excellent way for your child to develop their motor skills and hand-eye coordination. We also liked how the joints have been designed to work independently as it provides the toy with a more realistic feel. Moreover, the remote has a 2.4Ghz frequency which allows for precise and responsive control. Your little one can be standing up to 100 feet away from the toy and still be able to have total control. We also liked how the crawler belts have been made using ABS plastic materials that are free from toxins. The responsive controls and 360-degree spinning cab allows kids to use the toy to play with a lot of creativity to be entertained for years to come. This option is best for kids who may be beginners to these kinds of toys. This is because the controls are more simple by allowing children to move the toy backwards and forwards without worrying about any of the other functions. Using this remote is awesome for helping your little one to develop their motor skills and hand-eye coordination. Furthermore, there are flashing lights that are colorful to make the playing experience more exciting. This is also an excellent way to help your child to improve their visual learning senses. Not to mention, it can also encourage them to use the toy to play with more imagination and improve their creative thinking skills. This is a fantastic choice for beginners due to how easy the controls are to use and how they’re able to play with creativity for hours on end. 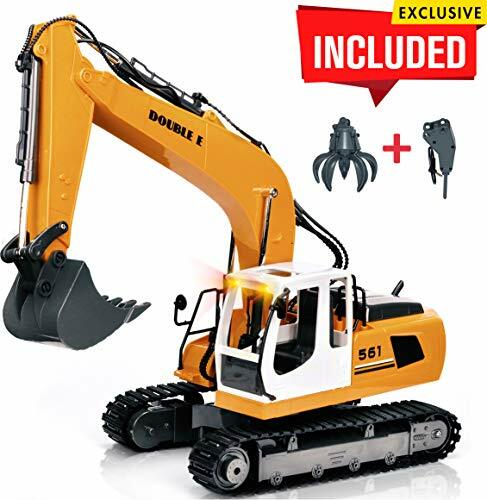 This RC truck excavator toy from Double E comes with a grabber, breaker, and shovel, which provides kids with a lot of different options to play with and keep themselves entertained for a long time. These pieces have been made with strong materials that allow kids to pick up, move, and dig a range of different things. We also liked how these parts all have separate joints as it means kids can control them separately. Their motor skills and hand-eye coordination are able to develop well while using the remote to control the toy. Not to mention, there’s a 680-degree spinning cab that lets your little one play in even more creative ways. People have nothing bad to say about this one so far! The 3-in-1 design and 680-degree spinning cab means that your child can use this toy to play with a ton of imagination to have fun for hours. The driving cab and loader have been made with high-quality alloy and metal materials that keep it incredibly durable for years to come. We were also impressed with how it has been designed with a 4-wheel drive feature. This works effectively to let kids control it to move across different surfaces with smoothness. They can also used the loading arm independently to make the toy work more like a real excavator. This is an awesome feature that inspires kids to play with more creativity. Not to mention, your little one’s motor skills and hand-eye coordination are able to develop well while using the remote control. With the 4-wheel drive feature and independent working arms, kids can have a blast taking this toy on rougher surfaces and seeing how much fun they can have with it. This GearRoot Toy has a cab that can rotate and allows kids to move it in any direction they like. They can dig things up and pour them out as well, which keeps them entertained for hours. Using the 2.4Ghz remote provides them with responsive controls and is a great opportunity for them to develop their hand-eye coordination and motor skills. We also liked how they’ve designed this one to look like a real excavator. This makes the playing experience more exciting for kids and inspires them to play in more creative ways. We also liked how they can be standing up to 100 feet away from the toy and still have total control. 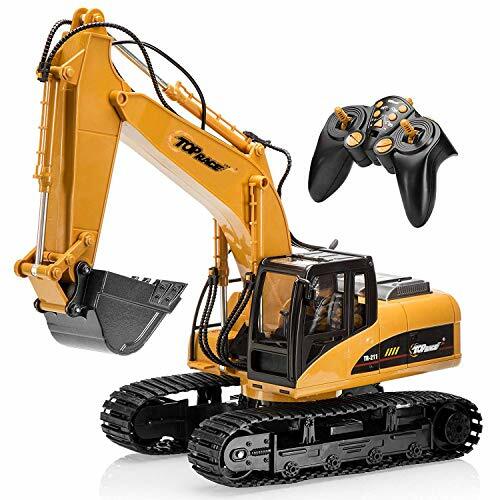 We liked how they’ve made this one look like a real excavator as it makes the playing experience more exciting and encourages kids to play with more imagination. We liked how all of the joints available with this tractor toy are able to work independently as it provides kids with precise control over the digger arm. The 2.4Ghz remote is super responsive and lets kids have total control over the toy. While using the remote, your little one’s motor skills and hand-eye coordination are able to develop well. They can also be standing up to 100 feet away from the toy and still have control over it due to the minimized signal interference. We were impressed with how they have included flashing light and music features as well. This makes the playing experience more exciting, which is awesome for your child’s creative thinking skills. It also develops their visual and auditory learning senses. This is a super fun toy as it comes with flashing lights and sound effects that kids have been loving. It encourages them to play with more imagination. The 8-channel remote that comes with this one allows kids to control it to move in any direction they like to have a blast for hours. This is an effective way to help your little one improve their motor skills and hand-eye coordination as well. There are flashing lights and sound effects available too. Kids absolutely love these features as it makes the playing experience more fun. Their auditory and visual learning senses are also provided with a fantastic opportunity to develop well. In addition to this, we liked how they have used high-quality ABS plastic materials which are durable and free from toxins. The USB cable that’s available also makes charging this toy a breeze. Kids have been loving how this one comes with light and sound effects as it makes it more fun to play with. It also inspires them to use the toy to play with plenty of creativity. This timber grab toy comes with a 2.4Ghz radio system that works to minimize any interference and let kids have precise control over the toy. Their motor skills and hand-eye coordination are able to develop well while using this remote too. We also liked how the cab can rotate 680-degrees as it provides kids with the freedom to play with the toy in different ways As a result, you can expect their creative thinking skills to improve. There are also light and sound effects included which make the toy that much more exciting for your little one to play with for hours on end. Their visual and auditory learning senses are also able to improve greatly. We liked how this toy has light and sound effects as it encourages children to play with more creativity, while improving their auditory and visual learning skills. The powerful motor that has been fitted to this excavator toy allows kids to take it across rougher surfaces and have a blast. There’s also a 680-degree rotating cab which lets kids have more freedom to control it however they like. We were also impressed with how there are high-quality rubber track tires available as they make the toy great for both indoor and outdoor use. The 2.4Ghz remote also minimizes any interference to let kids control it with precision. Your little one’s motor skills and hand-eye coordination are able to develop well while using the remote as well. Parents have been liking how the USB cable that’s provided makes charging this one super easy. Kids have been having an absolute blast being able to take this toy on rougher surfaces to dig things up and get creative for hours on end. 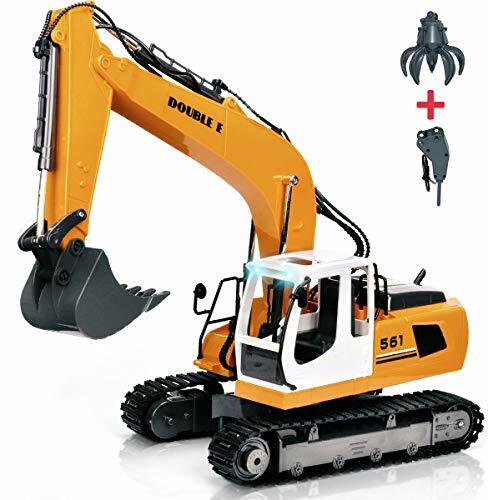 This excavator Vehicle features a range of light and sound effects that children have been loving. Not only is it great for their auditory and visual learning senses, it also helps them to play with more imagination. In addition to this, there’s a mud splatter effect that provided the toy with a more realistic feel. This is an excellent feature that encourages your little one to use the toy to play in more creative ways. While using the remote to control the vehicle toy, your child’s motor skills and hand-eye coordination are given a fantastic chance to improve greatly. We were impressed with how this toy has fun light and sound effects, as well as a realistic design, as it encourages kids to use it to play more creatively. 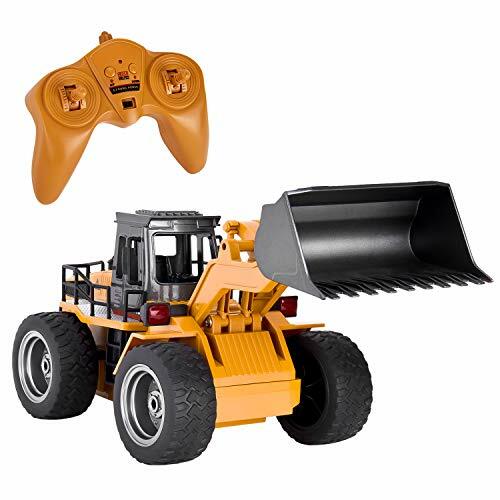 Now that you have a better understanding of the kinds of features that these remote control toys have to offer, you can start to focus on the ones that stand out to you as being the best. If you’re having a tough time trying to whittle down the options, you’ll want to check out this buyers guide section to gain some more additional information. 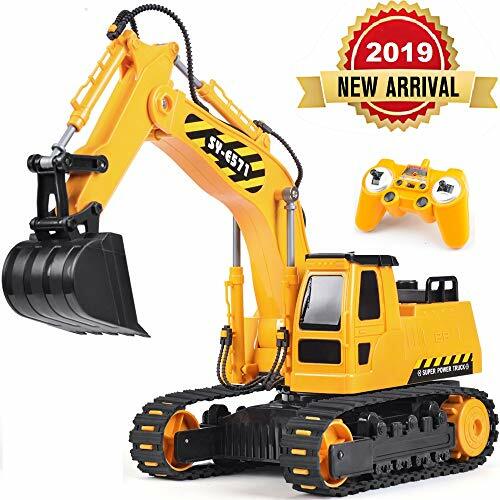 After reading through the different RC excavator toys in this review, you will have seen that there is a number of different options available. If you were interested to learn a little more about these choices, take a look at the section below. Bulldozers are a lot of fun for kids to use as they can use them to recreate what they may have seen them do in videos or in real life. As a result, they are fun toys that are awesome for inspiring your child to use their creative thinking skills. The diggers are excellent for children who love to play outdoors. This is because many RC digger toys have been made with strong materials and fantastic tires that allow them to be used on rougher surfaces without any hassle. Forklifts are another super fun type of RC toy that kids love using to lift different items up and transport them around. It can be a fun way for them to use their imaginative play abilities. While considering the various options mentioned throughout this review, you may be interested to learn a little more about what the top brands of these toys have to offer. If so, the section below is for you. Top Race is a fantastic company that is committed to making high-quality RC models that kids can enjoy playing with for years. We liked how they have a wide range of toys that range from UFO’s and cars, to planes and helicopters. SGILE is an awesome brand that are considered to be professional toy sellers. They have been dedicated to ensuring that children are able to immerse themselves in the playing experience, which encourages them to improve their creative thinking skills. They also like to ensure that all of their toys are taken through strict safety procedures to ensure that they’re suitable for children. Dickie Toys is a unique brand that can make some highly technological toys, as well as the most simple ones available. Either way, children have been having an absolute blast with the toys that they manufacture for years. They have many different toys that are effective for helping kids at every stage of their development while they’re growing up. 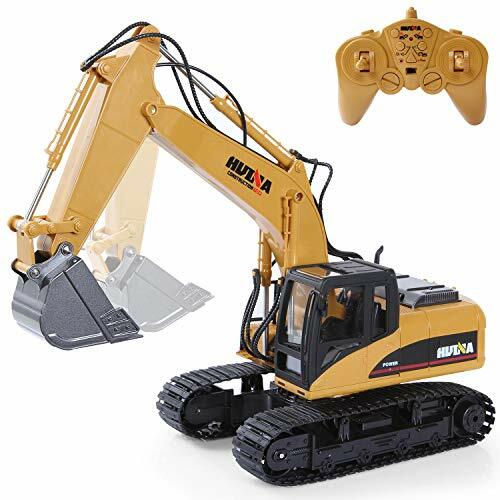 If you’ve been doing some research for yourself, you may have seen that there are a few other kinds of excavator toys, aside from remote control ones, available. The section below delved a little into these other toys and what they have to offer, in case you were interested. There is a range of excavator ride on toys available that kids find incredibly exciting. It allows them to get on top and scoot themselves around to have a blast. They are excellent for helping your little one to develop their balance, as well as strengthen their legs. Excavator push toys are super fun for children as they can implement them into their imaginative play scenarios to keep themselves occupied for hours. As a result, their creative thinking skills are able to flourish. We also liked how these toys involve a hands-on approach as it develops your child’s hand-eye coordination and motor skills. So, that concludes our review on what some of the best RC excavator toys have to offer. Be sure to consider all of the main features, pros, cons, age recommendations, and what makes each toy stand out before making a final decision. The buyers guide section also contains some additional information that could be handy in helping you to feel confident about making a purchase. 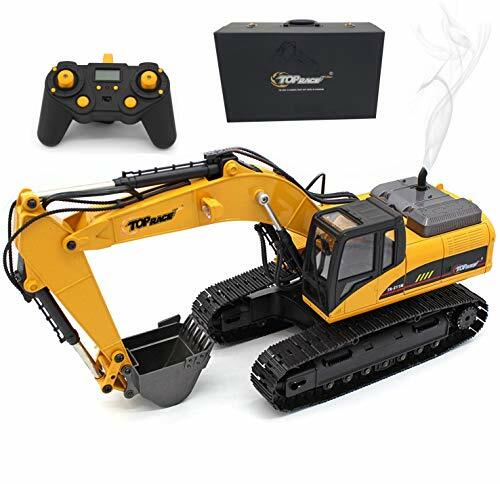 Hopefully, everything you need to find the perfect remote control excavator toy for your little one can be found in this post!